Though it is a bit late to write about the pilgrimage, I felt like I must start to do it right now as I would like to share my memories with others Insha-Allah (God-willing). Who knows, may be my experience will motivate someone out there to do their hajj while they are young and able enough to go through all the hardships in Makkah and Medina. Hajj is one of the pillars of Islam. Whoever is able to perform it, should embark upon this spiritual journey at least once in their lifetime. Usually most of the time the majority of the pilgrims turn out to be the aged people. There are some valid reasons for that, though. Most of the Muslims in this world belong to poor developing countries who are not financially able enough to perform their hajj while young. Most of the times, hajj is regarded as a dream to be performed when enough money has been gathered to do so. I have met some women in Saudi who were widows from Bangladesh and they spend their whole fortune on it. It was really emotional to see that some people could be so much eager to perform hajj despite all the problems they encounter. As for us, people from Europe, it is not a big issue in terms of money. Sometimes, it is just the lack of enthusiasm which hinders us from going to hajj as soon as possible. Or sometimes, it is just the ‘so called planning’ that we have to do this and that first i.e. finishing study, having a job, getting married, starting a family, etc and…then we may go to hajj which makes us delay this important journey. But we must question ourselves how come we have got that much confidence that we will be able to perform hajj eventually. Who has guaranteed us that we will live until that time? You never know! This could be your last minute by the time you finish reading this sentence! So I would recommend my dear brothers and sisters to perform this obligation as soon as possible. Trust me; it will change your life forever. Besides, the peace of mind you get from doing this act is priceless. Hajj is a very special type of worshiping Allah SWT. You will be involved in it not just spritually but physically, financially and emotionally.It helps us to gather wisdom. It makes us realize the ultimate truth about our life. It reminds us that we must prepare to leave this world with enough provision to gain success in the hereafter. We left for Saudi Arabia on the 2nd of January 2006 from Heathrow at 8 pm. We reached Jeddah after five hours. We had to wear ihram on the plane and we had to perform all the prayers while sitting as no place was available to stand. I was feeling very happy as the atmosphere in the plane was quite unique. All of the passengers were pilgrims, wearing white hajj attires and there was a huge queue for making ablution in the toilet. The airhostesses were struggling with that huge crowd as there was a shortage of water! Everyone was getting ready for the hajj. The TV screen was continuously showing the various aspects of hajj and what to do and what not to do. I could not sleep as I was feeling very excited about the whole thing. The images of Ka’ba made me feel very lucky that finally I am on my way to that wonderful place which I use to see in TV screens, internets, newspapers and so on. I felt that I must be very lucky to have this wonderful opportunity despite all of my shortcomings as a Muslim. Alhamdulillah. When we reached Jeddah, the feelings were much more intense as we felt that we have finally reached the land of our beloved prophet Mohammad (Peace be upon him).We had to wait for more than five hours in Jeddah hajj terminal. I don’t know how many times each of us had to show our documents. It was annoying but we didn’t have any other choice but to go through that lengthy process with patience. I heard that the airport workers were not professionals; instead they were local Saudi university students hired for the booming hajj time. I must say, one thing you need in plenty during hajj and that is patience. So sabr is the keyword for this journey. We reached there at 2am local Jeddah time and we left for our destination the holy city of Makkah at 8 am in the morning. Imagine standing there in the terminal for the last six hours after the plane journey. It was indeed a tiring start but Allah had made it easy for us to endure all of that. We were looking forward to start our trip to the holy city of Makkah. "Labbayk Allahumma Labbayik Labbay'ka L-aa Sharika Laka Labbayik. Innal Hamda Wan Ne'mata Laka Wal Mulk Laa Sharika Lak"
This statement has an amazing effect. During the state of ihram wearing white cloths, when you say that again and again loudly with others, it feels like you are finally trying to come closer to Allah. Nothing matters anymore. You have left everything behind and going forward to take a step closer to Allah. This is not just a spiritual experience but also a very intense physical one. It is said that before going to hajj you must complete your unfinished businesses and try to make up with your relatives and friends if you had any grudge against them. It is like preparing for the death. As a result, hajj makes us understand the feeling of saying goodbye finally to loved ones. Before heading towards the Kaa’ba, our bus went to Taif. As far as I remember Taif was the city where our prophet went from Makkah to invite the people of Taif to Islam but they behaved very rudely with him and stirred its children to throw pebbles on him. It was one of the most difficult periods for our beloved prophet (SAW). It was asked by the arch angel Jibril (AS) whether he would like to see the people get punished due to their utter rudeness but our beloved prophet told him not to punish them in the hope that their coming generation might accept Islam. If you see the city now (with 100% Muslims), you are bound to feel great by our beloved prophet’s mercy upon its ummah. Allah says it all in the Qur’an: the prophet SAW is the mercy to the whole of the world. We reached Makkah after 11 am. The city is surrounded by lot of mountains. The kaa’ba, surrounded by mountains, looks like a grand palace surrounded by huge natural boundaries. It does not give the impression of an ordinary palace though. It is something beyond description. For me, when I first saw the gates of the kaa’ba, it felt like something totally alien to its surroundings. I don’t think anyone would be interested in anything else if he or she sees kaa’ba in Makkah city. To me, it seemed like a giant magnet attracting everyone around to come and visit this holiest place on earth. Though we needed to go to our hotel first, I wished I could go inside it and see the Kaa’ba for the first time. Alhamdulillah I was not the only one having that strong urge, within an hour we (my father and me) found our self inside it for the zuhr prayer. The view was breathtaking. 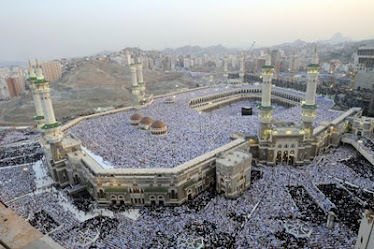 The sheer number of people inside it is another amazing thing to witness, Allahu Akbar (God is great)! I was feeling great to see how many people worship the same God of mine! My sense of self was gone immediately and I felt like I am just one of the tiny particles of atom among this vast sea of creation Subhanallah! We all will stand together on the Day of Judgment with our beloved leader of the ummah, Muhammad SAW. What a great scene that would be! As we were in the state ihram for the umrah at that time, we did our tawaf (going around of Kaa’ba for seven times) and the running between the hills of Safa and Marwa for seven times in the evening of the day of arrival. I don’t know where we have got the energy from to do all these difficult tasks in one go. Indeed Allah SWT has helped us a lot. Alhamdulillah. I have seen lot of very aged people performing their rights of umrah very passionately without any sign of exhaustion. When you have the sincere intention to do something just to please Allah, nothing can stop you from your goal. Moreover, you feel very very satisfied worshiping Allah SWT in that environment. The whole situation there is bound to boost your imaan, Subhanallah!